The Bayshore beaches, estuaries, salt marshes, rivers, wetlands, open fields and forests are habitat for many of the Bayshore’s rare wildlife species. These species are threatened because their habitat has been lost or impacted by pollutants. 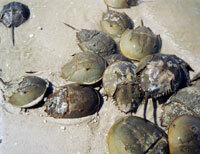 The Delaware Bay is a marine habitat that contains the largest remaining population of horseshoe crabs on earth. These 350-million year-old “living fossils” march up bay beaches each spring to lay tiny green eggs. Their eggs are the sole food source for thousands of shorebirds traveling from South America to the Arctic. Protection of Bayshore habitats will increase the survival rate of local and worldwide populations of many rare species of fish and wildlife. The Bayshore region has many threatened and endangered species. Endangered Species are those whose prospects for survival in New Jersey are in immediate danger because of a loss or change in habitat, over-exploitation, predation, competition, disease, disturbance or contamination. Assistance is needed to prevent future extinction in New Jersey. Threatened Species are those who may become endangered if conditions surrounding them begin to or continue to deteriorate. The NJ Department of Environmental Protection (NJDEP) Endangered and Nongame Species Program maintains lists of New Jersey’s endangered and nongame wildlife species. These lists are used to determine protection and management actions necessary to ensure the survival of the state’s wildlife. The Endangered and Nongame Species program has information about Threatened and Endangered species in New Jersey, how to recognize them and how to report a sighting. The NJ DEP’s Landscape Project has identified critical habitats throughout the state and provides maps of these areas. Mapping information that requires ARCView software can be downloaded from the Endangered and Nongame Species Program. These maps can be viewed online through your webbrowser with the NJ DEP’s i-MapNJ program or on compact disk by calling the Endangered and Nongame Species Program at 609-292-9400.